Micheal Martin at his party's Ard Fheis in January. FIANNA FÁIL LEADER Micheál Martin says that he hopes the UK’s Brexit vote will eventually lead to a referendum on a united Ireland. Delivering the John Hume lecture at the MacGill summer school in Donegal, Martin says that the Brexit vote is a “defining moment in Northern politics”. A majority of people in Northern Ireland voted to stay in the EU while the UK as a whole voted to leave. “It may very well be that the decision of Northern Ireland to oppose the English-driven anti-EU UK majority is a defining moment in Northern politics,” Martin said. The Remain vote may show people the need to rethink current arrangements. I hope it moves us towards majority support for unification, and if it does we should trigger a reunification referendum. “However, at this moment the only evidence we have is that the majority of people in Northern Ireland want to maintain open borders and a single market with this jurisdiction, and beyond that with the rest of Europe,” he added. The Fianna Fáil leader also said he welcomed the government’s promotion of an “all-island approach to Brexit” before adding that any discussions must be inclusive. Martin also took aim at the media and the government for a “hands-off detachment” on Northern Ireland issues. “It is a sad reality that our government and our media have tended to ignore Northern Ireland except when there is a crisis,” he said. 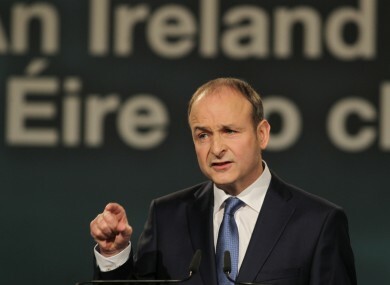 Martin’s comments come as his party overtook Fine Gael as the most popular party in the country, according to a poll in the Sunday Business Post. The poll put Fianna Fáil at a support level of 29% compared to 26% for Fine Gael. Email “Micheál Martin hopes Brexit will lead to a vote on a reunited Ireland”. Feedback on “Micheál Martin hopes Brexit will lead to a vote on a reunited Ireland”.